Middle age brings with it some unwelcome changes to the body, and weight gain is arguably the most undesirable of these. The average woman gains between 12 - 15 pounds between the ages of 45 - 55. This is partly due to changes in hormone levels affecting water retention, muscle tissues, and metabolism, but - as for everybody, young and old - diet and exercise also have significant influence. You may need to adjust your diet to keep the extra pounds off during menopause. We hear a lot about them and how important they are in a healthy diet, but it's easy to forget the actual role they play in the body and why we need them. There are 13 essential vitamins that each have specific individual functions, but generally, they are all necessary for healthy cell function and normal growth in the body. As the body is unable to synthesize them, we must obtain them from external sources, primarily dietary ones. There are two types of vitamins: fat-soluble and water-soluble. They are required in smaller doses than water-soluble ones, because they can be stored in the liver and the body's fat tissues. These include vitamin A, found in sweet potato, liver, spinach, and carrots; vitamin E, found in nuts, seeds, and mackerel; and vitamin K, found in spinach, broccoli, and cauliflower. While these offer numerous health benefits and are each essential for various functions in the body, none of these play a specific role in weight loss. Vitamin D is also a fat-soluble vitamin, found in fatty fish, such as mackerel and salmon, and in small doses in eggs and cheese. Vitamin D regulates the modulation of cell growth and neuromuscular function, which could mean improved productivity during exercise, but this is tenuous; there are no specific links between vitamin D and weight loss. This kind of vitamin cannot be stored in the body, which means they must be consumed on a daily basis for their benefits to be enjoyed. Examples include vitamin C, found in citrus fruits, and vitamin B12, found in beef liver, clams, fish, and milk. Adults require between 75 - 90 mg of vitamin C a day. Studies have found those with adequate levels of vitamin C are able to oxidize 30% more fat during an exercise session than those with a deficiency, which means more productive fat-burning in those with a diet rich in vitamin C. What's more, the primary source of vitamin C is citrus fruits, which are naturally low in fat and are therefore conducive to a weight loss diet. Vitamin B12 helps to prevent megaloblastic anemia, which makes people tired and weak. Consuming the recommended daily 2.4 mg could help boost energy levels and metabolism, thus stimulating the burning of calories. Deficiencies in B12 are common; as many as 15% of people have difficulties absorbing B12, and sufferers may notice a loss of appetite and resultant weight loss as a consequence of this. There are many myths about weight loss, many of which promote various vitamin supplements as a quick-fix way of shedding fat. 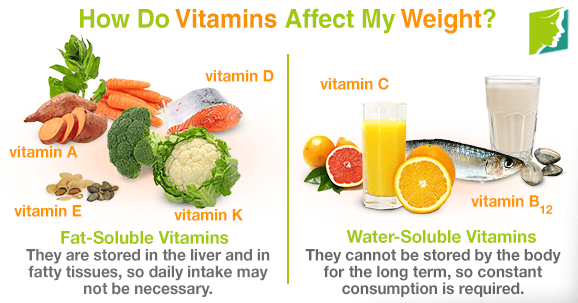 In reality, the role of vitamins is for general health and growth in the body. Eating foods rich in them is important, but replacing high-fat, sugary, and salty foods from your diet with fruit, vegetables, fibers and exercising regularly will ultimately be the most important tools for managing your weight.